(partial) The British planning education scene: Planning education: a European view of British experience. The 'specialist' versus 'generalist' conflict 1963-5. British planning education: The changing scene. From the work-bench of planning education: Teaching the planning process. Action space analysis (with an Appendix: The East Oxford case study). Sociology in planning education, or. A look into the mirror: The experience of sociologists in their collaboration with planners. The position of sociology lecturers in planning schools. Sociology in planning education. Synthesis: Planning theory and the education of planners. 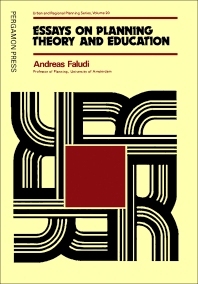 A selection of essays concerned with the evolution of thought in the fields of both planning theory and education. A joint treatment of these closely related themes adds to the understanding of planning theory as a conceptual basis for planning and aims to engender discussion of improvements to the education of planners.